Georgiaâ€™s borders are guarded by some of the best radiation detectors available â€” so why are nuclear smugglers still slipping through? The radiation alarm started wailing and flashing its red strobe light on an otherwise ordinary day last August as a car tried to pass through the Sadakhlo border crossing. The alarm itself wasn't unusual. This remote outpost linking the former Soviet republics of Georgia and Armenia scans hundreds of cars, buses and trucks every day, and the radiation monitors, housed in their distinctive white casings, are regularly triggered by the natural radioactivity in ceramic tiles, quarry stones "” even bananas. But the levels of Î³ radiation in this car, and on its Armenian driver, were so high that the checkpoint police were compelled to call in the Georgian government's special nuclear investigators in the capital city of Tbilisi, about two hours drive away. Once there, the specialists determined that the car was heavily contaminated with caesium-137, a radioisotope often used for cancer therapy and food irradiation "” and often cited as an ideal source for a radiological dispersal device, better known as a "˜dirty bomb'. But they couldn't find any caesium-137, or proof that the driver was deliberately transporting anything dangerous. So the officials found themselves at an impasse: what should they do? Such conundrums are also not unusual in this part of the world. From a technological perspective, the Sadakhlo crossing is about as advanced as it gets "” a showcase for international efforts to stop the illegal trafficking of nuclear materials. The Georgian patrol police who staff the station can check passports against a centralized database, capture video recordings of every person crossing the border and rely on the radiation monitors to watch for telltale Î³-rays and neutrons. Sadakhlo is just one of the many such modern border crossing facilities that can be found in Georgia and much of the rest of eastern Europe, as well as in an increasing number of ports worldwide. The hardware is provided through a US anti-proliferation programme known as the Second Line of Defense "” the first line being the global effort to secure nuclear materials at their source. Run by the US Department of Energy's National Nuclear Security Administration, the programme's long-term goal is to protect more than 650 sites in 32 countries. And US President Barack Obama, who has made non-proliferation a cornerstone of his foreign policy, submitted a 2011 budget request that would continue this focus, doubling the annual funding for Second Line of Defense to more than half a billion dollars by 2015. Radiation detectors are plagued by false alarms. Given the scale of that effort, as well as funding from the European Union for training, it is sobering to realize how porous the defence is. The radiation monitors have had some success at intercepting radiological sources, as in the August incident at Sadakhlo. But they have had just one claimed success at intercepting fissionable material suitable for use in a nuclear weapon "” again, at Sadakhlo. At the time, the crossing wasn't as high-tech and the detectors were an earlier model than the ones now in place. But on 26 June 2003, the border guards closed in on an Armenian citizen named Garik Dadayan, who was found to be carrying 170 grams of highly enriched uranium (HEU). Although this is far too little for a nuclear weapon "” that would require more than 10 kilograms "” the case did confirm the existence of a black market in fissile materials. It also, according to US officials, validated the use of the detectors. Others are not so sure. "Border policemen said the detector worked; other police officers say [the uranium] was not detected," says Alexandre Kukhianidze, who directs the Caucasus Office of the Transnational Crime and Corruption Center in Tbilisi. But one thing is clear: technological solutions such as radiation monitors are far from a panacea for nuclear smuggling. And Georgia is an excellent case study for why that is. Smuggling and bribery were once a way of life in Georgia, which lies on a key transit route between Russia and Turkey. And this was especially true in the post-Soviet era, when the chaotic regime of former Georgian President Eduard Shevardnadze left the police chronically underfunded and susceptible to bribery. But after Shevardnadze was ousted in the Rose Revolution of November 2003, the government that replaced him instituted sweeping reforms, strengthened Georgia's already close ties to the West, and expanded its cooperation with Western nuclear security efforts. Today, Georgia is widely considered a model citizen in the nonproliferation world. Georgia's ports and border crossings contain some of the world's most advanced nuclear detectors. Certainly the officials there swear by their radiation detectors. Trying to track down non weapons-grade radiological materials without them would be like operating "without hands or legs", says Alexander Okitashvili, deputy director of the Georgian patrol police, who watches videos of the borders in real time from his desk in Tbilisi. And both US and Georgian officials agree that radiological materials are by far the biggest nuclear smuggling threat, accounting for 321 of the 336 confirmed cases of illicit nuclear trafficking reported to the International Atomic Energy Agency in Vienna between January 1993 and December 2008. Only 15 involved weapons-grade HEU or plutonium. Still, the monitors have many pitfalls. Their propensity for false alarms is one. And another, paradoxically, is that the potentially deadliest materials "” fissile HEU and plutonium "” are not strongly radioactive. One obvious upgrade was to add the ability to detect neutrons produced by the spontaneous fission reactions that occur in any bomb-grade material. The original devices, which were installed by the US State Department in Georgia and other parts of the world during the 1990s, could detect only Î³-rays. The upgraded portal monitors were installed last year and can now be found at every border crossing, port and airport in Georgia. Another refinement, currently being pursued by physicists at the Pacific Northwest National Laboratory in Richland, Washington, is to equip the detectors with "˜energy windowing' algorithms that would give an approximate measure of the energy of the Î³ rays. Each element has a unique Î³-ray spectrum, so this would help the detectors to distinguish between real threats and naturally occurring radioactive materials. Researchers also are trying to improve neutron detection by looking at how neutrons are emitted by materials exposed to cosmic rays. However, none of these technological efforts gets at the much more serious, non-technical problems with relying on the detectors, such as the fact that they are installed only at official checkpoints. 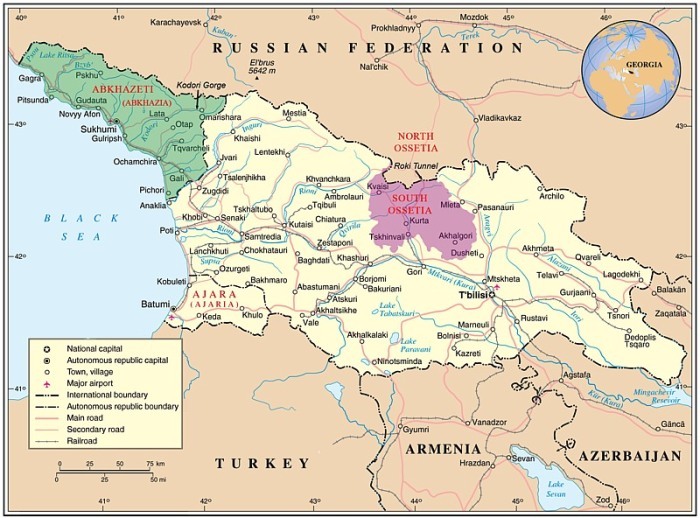 Georgia hasn't installed detectors at crossings into the Russian-backed breakaway regions of Abkhazia and South Ossetia (see map), because to do so would be a tacit recognition of the regions' independence. Nor can Georgia control what passes across the borders between Russia and these regions, which have long been regarded as smuggling havens. Given those realities, critics charge that detectors are effective only against nuclear smugglers who are too stupid or lazy to go around the checkpoints, or too incompetent to shield the material they take through. "You will be able to catch the Richard Reids, but not the Mohamed Attas," says nuclear physicist Thomas Cochran of the Natural Resources Defense Council in New York, comparing the "˜shoe bomber' with the lead hijacker in the 11 September 2001 attacks. But for every bumbler there are unknown numbers of smart operatives whom the radiation detectors never see, says Pavlenishvili, who says that his team captures two to three smuggling rings every year. For them, he says, the answer is solid, low-tech police work. In 2005, for example, a tip from an informant led him and his team to mount a sting operation. They caught Oleg Khintsagov, a Russian citizen, in a suburb of Tbilisi trying to sell 100 grams of HEU to a man he believed was a Turkish go-between, but who was in fact a Georgian operative. When arrested, Khintsagov claimed that the blue-grey substance was printer powder. In fact it was military weapons-grade uranium enriched to 89% of the fissile isotope, uranium-235. All the detectors in the world won't answer that question. Nor will captured smugglers, as a rule, who typically deal with intermediates, and may not even know the final customer. Dadayan, for example, provided little useful information, and was soon turned over to Armenian authorities. And Khintsagov is still in a Georgian prison, refusing to talk. Not even the Armenian citizen caught last August yielded any definitive answers. "The driver told an unbelievable story," says Pavlenishvili. "He worked in a radio station, and said maybe because he was dealing with specific electronic equipment, his car and clothes were contaminated. It's not true, of course. " But unable to find the source in the car, says Pavlenishvili, we had "no legal possibility to arrest him". Instead, the driver was simply let go. Sharon Weinberger is a freelance reporter in Washington, DC. Her trip to Georgia was funded by the International Reporting Project in Washington DC.